Sculptor, architect and pedagogue Václav Cigler (* 1929) is indelibly written into the history of the world fine art, because he was the first to work with optical glass. However, his work is much more diverse, as shows an extensive exhibition of his drawings at the Olomouc Museum of Art - Museum of Modern Art from March 21, 2019. It will be followed by art interventions by Václav Cigler and Michal Motyčka in the Flower Garden and in the Picture Gallery of the Kroměříž Archbishop's Chateau and the installation in the Archdiocesan Museum in Olomouc. Václav Cigler (*1929) ranks with the world-renowned names of the artistic generation risen out of the early 1960s. His work is centred on sculptural objects from polished optical glass, the designs and realisations of luminant structures, as-well as jewellery, drawings, landscape projects and architectural compositions. architecture or landscape. His work is about every one of us, about our deeper perception, our experience and ability to concentrate. It reflects the gentle movement of particles, the intensity of the transfer of energies or the dissemination of a certain kind of upheaval through space. The extensive selection of the presented drawings can be dated from the fountain designs for EXPO ’58 originating from 1956 to the present. The series came into being progressively in scheduled periods and blended with the artists life as part of his experiences and the situations he found himself in. Cigler’s work on paper captures the process, uncovers a powerfully authentic expression and deep intellectual subtext, which is both contemporaneously and indirectly accompanied by short texts, which the artist thinks of poetically. In a sense they present us with a universal picture of the artist’s way of seeing, the inspiration for which is the external natural world, and internal naturality. The large format drawings present the ideas and themes of the artist’s life-long deliberation on the creation of life on Earth and its meaning. They are so closely connected to their surroundings, it is as if there were no boundary between the external and the internal. We are dealing with the fields of the physical and biological laws governing nature and the universe. The drawings are undoubtedly among the more personal and spontaneous aspects of Cigler’s work, often being the conceptual and the foundation stages of his monumental realisations. The drawings as such do not require the viewer to have an insight and knowledge of where they fit into the context of his entire body of work. As opposed to other traditional conceptions of this medium, the drawings of Václav Cigler capture processes and storylines through light, which is ceaselessly in motion; light which travels along lines and captivates the surrounding architecture through its distinctive aesthetic qualities and spatial capabilities. It becomes an important means of communication between the exhibited works, the gallery space, and the viewer. 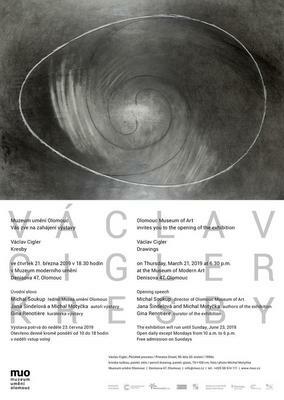 The artist’s monograph Václav Cigler Drawings I. Fields will be published on the occasion of the exhibition.